Cost Every market is different. 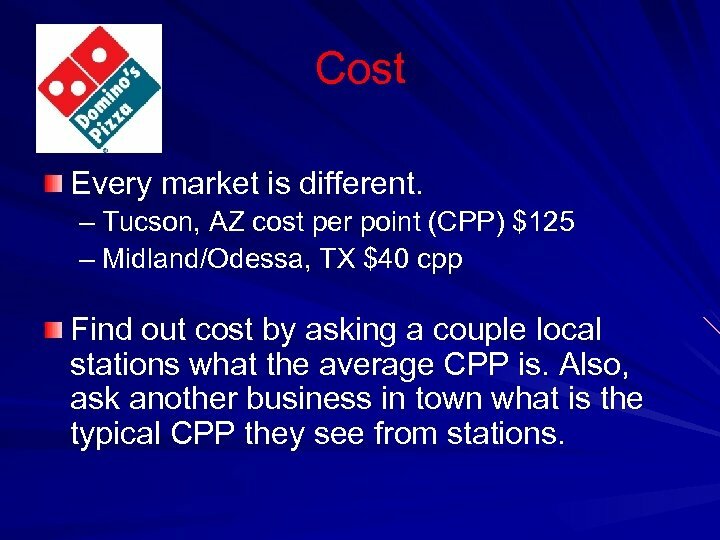 – Tucson, AZ cost per point (CPP) $125 – Midland/Odessa, TX $40 cpp Find out cost by asking a couple local stations what the average CPP is. Also, ask another business in town what is the typical CPP they see from stations. 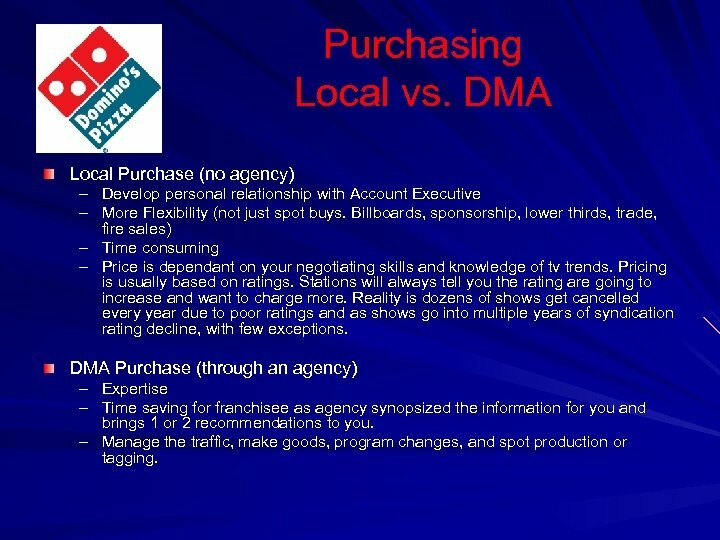 Purchasing Local vs. DMA Local Purchase (no agency) – Develop personal relationship with Account Executive – More Flexibility (not just spot buys. Billboards, sponsorship, lower thirds, trade, fire sales) – Time consuming – Price is dependant on your negotiating skills and knowledge of tv trends. Pricing is usually based on ratings. 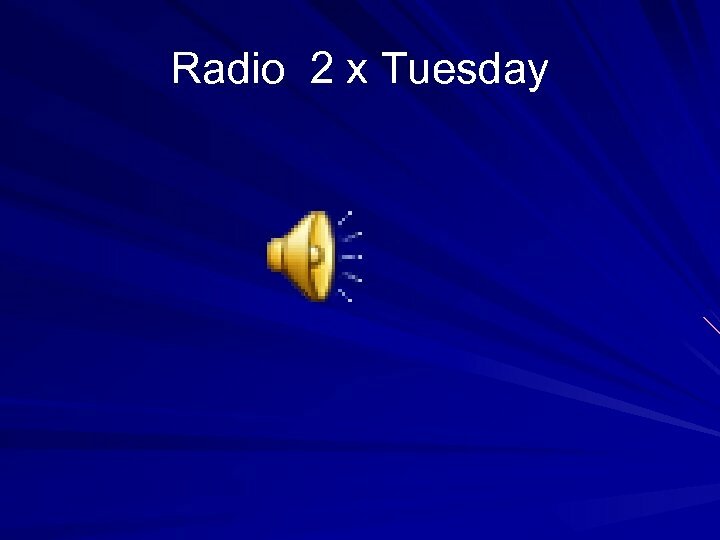 Stations will always tell you the rating are going to increase and want to charge more. Reality is dozens of shows get cancelled every year due to poor ratings and as shows go into multiple years of syndication rating decline, with few exceptions. 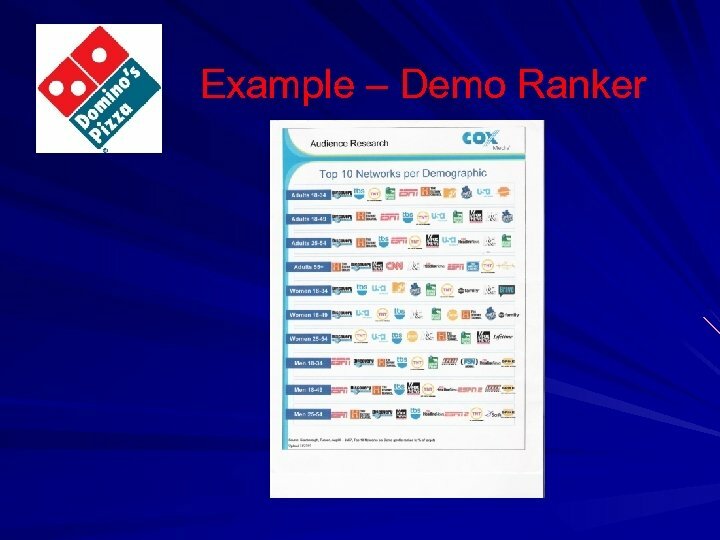 DMA Purchase (through an agency) – Expertise – Time saving for franchisee as agency synopsized the information for you and brings 1 or 2 recommendations to you. – Manage the traffic, make goods, program changes, and spot production or tagging. What Channels to Buy? 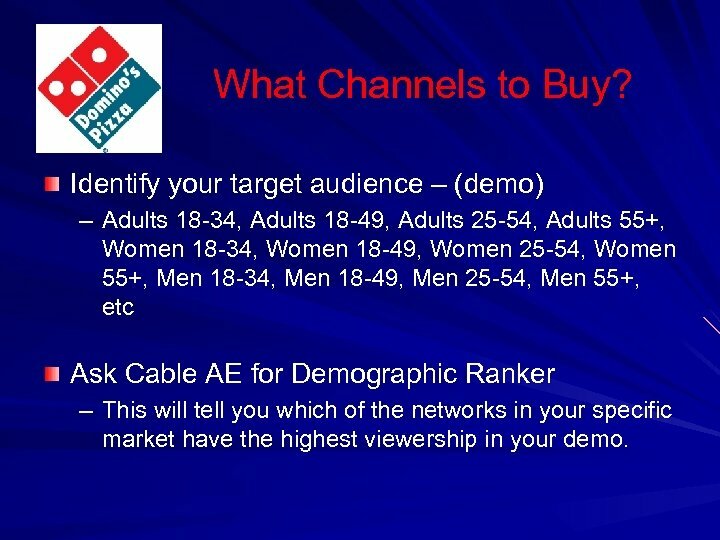 Identify your target audience – (demo) – Adults 18 -34, Adults 18 -49, Adults 25 -54, Adults 55+, Women 18 -34, Women 18 -49, Women 25 -54, Women 55+, Men 18 -34, Men 18 -49, Men 25 -54, Men 55+, etc Ask Cable AE for Demographic Ranker – This will tell you which of the networks in your specific market have the highest viewership in your demo. 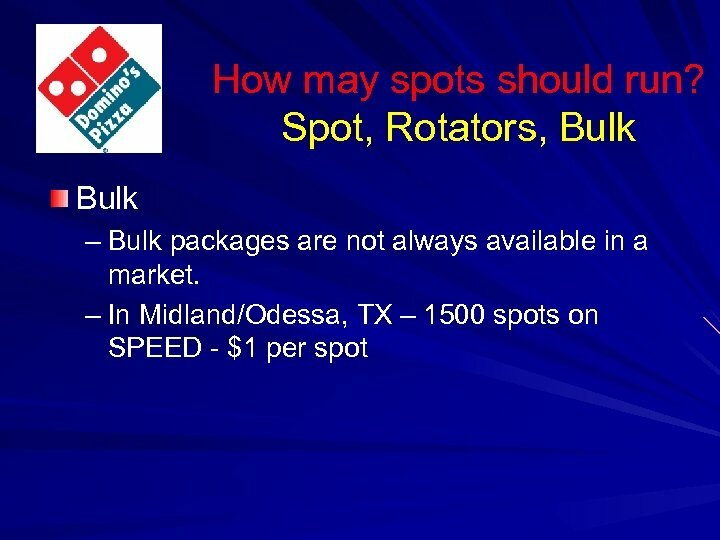 What time to run spots? 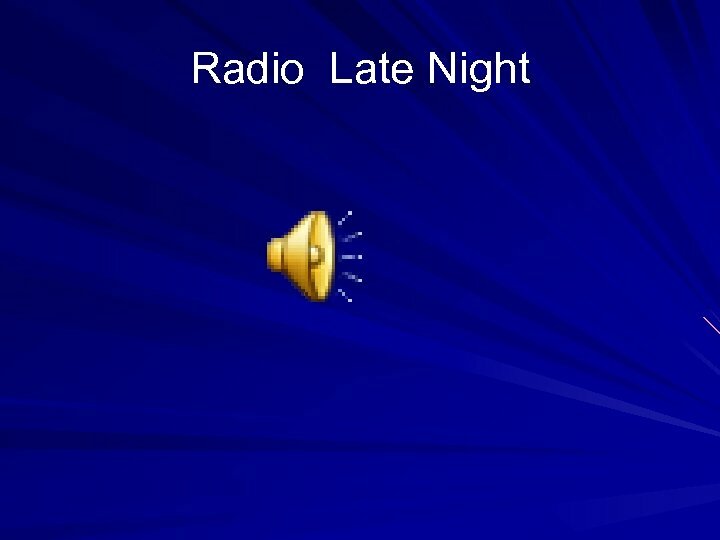 Determine what you are trying to achieve – General Brand / Product Awareness – Specific Daypart ordering If you are trying to building late night business, then you need to advertise on late night. 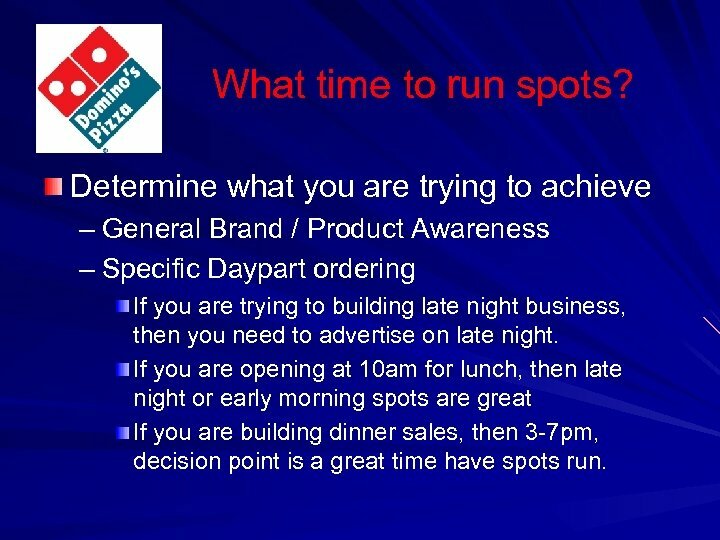 If you are opening at 10 am for lunch, then late night or early morning spots are great If you are building dinner sales, then 3 -7 pm, decision point is a great time have spots run. 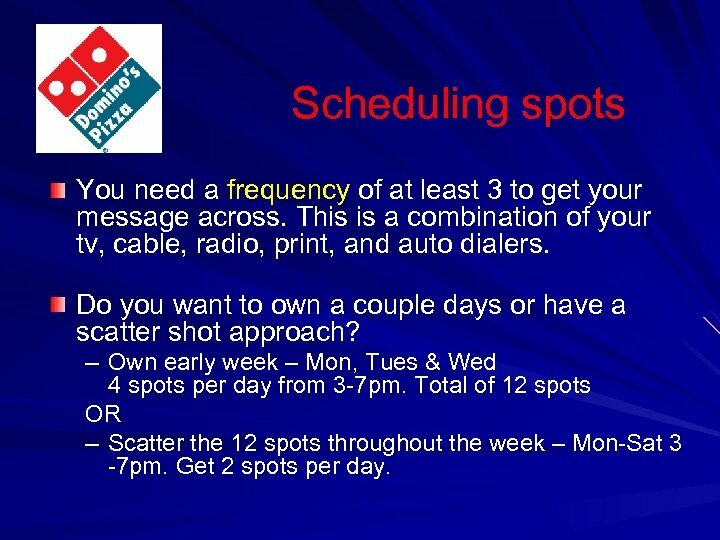 Scheduling spots You need a frequency of at least 3 to get your message across. This is a combination of your tv, cable, radio, print, and auto dialers. Do you want to own a couple days or have a scatter shot approach? – Own early week – Mon, Tues & Wed 4 spots per day from 3 -7 pm. Total of 12 spots OR – Scatter the 12 spots throughout the week – Mon-Sat 3 -7 pm. Get 2 spots per day. 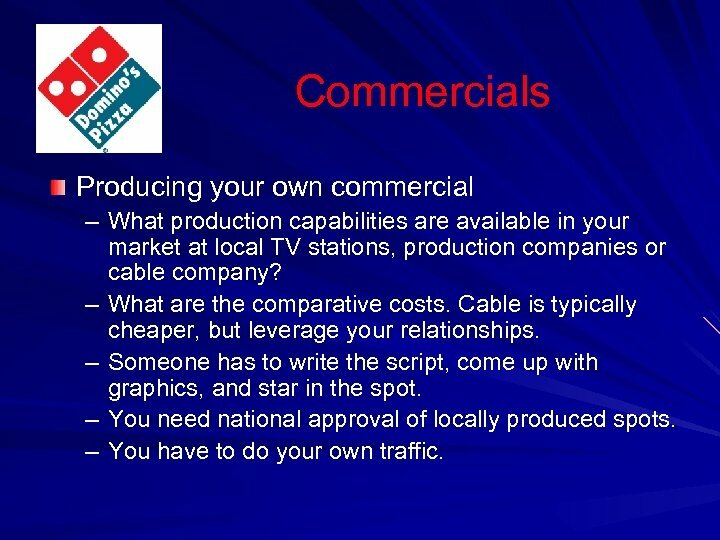 Commercials Producing your own commercial – What production capabilities are available in your market at local TV stations, production companies or cable company? – What are the comparative costs. 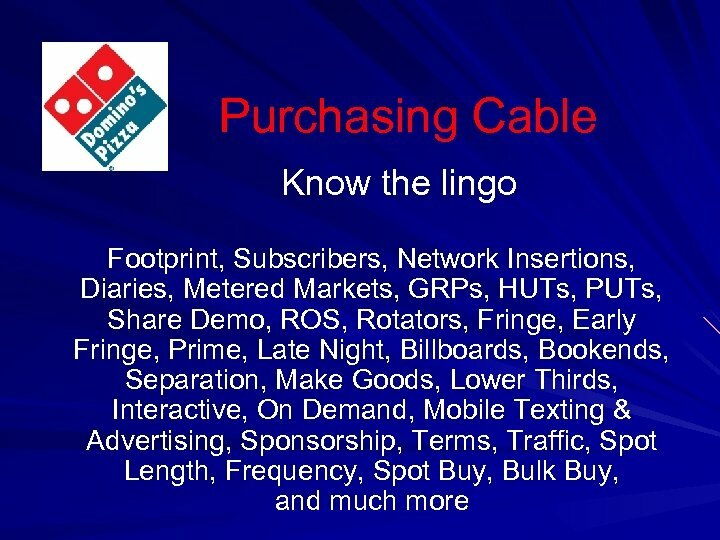 Cable is typically cheaper, but leverage your relationships. – Someone has to write the script, come up with graphics, and star in the spot. 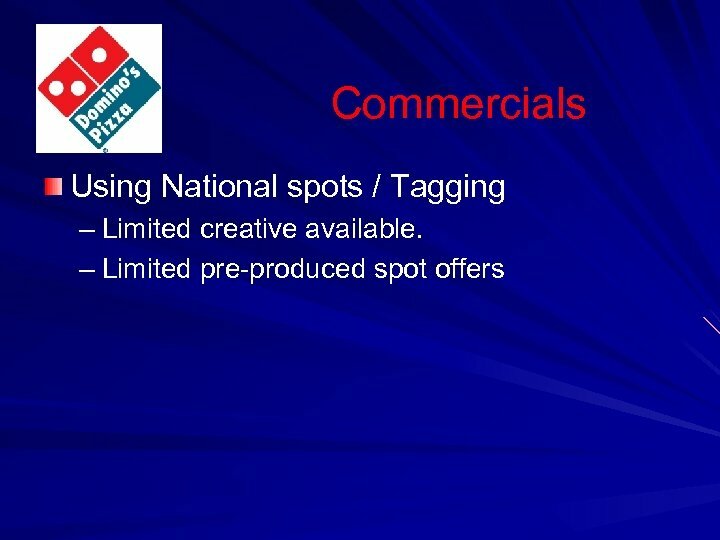 – You need national approval of locally produced spots. – You have to do your own traffic. Misc. 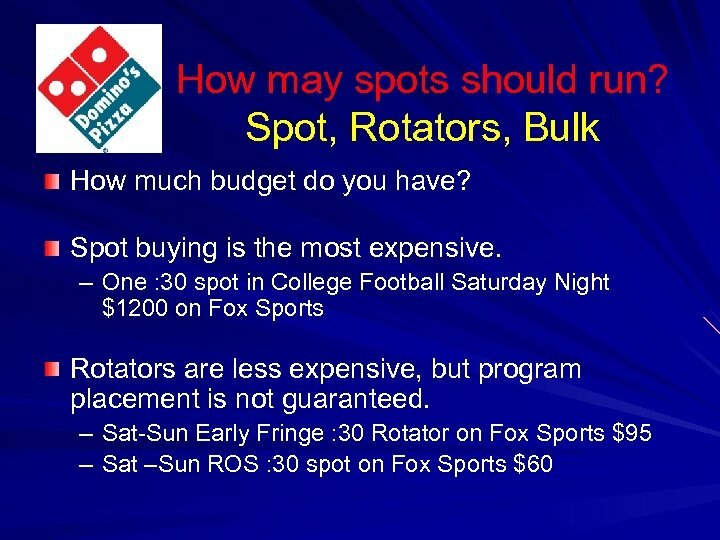 Tips Ask about bulk packages, annual buy pricing, and sports packages Negotiate by playing Cable against TV stations. 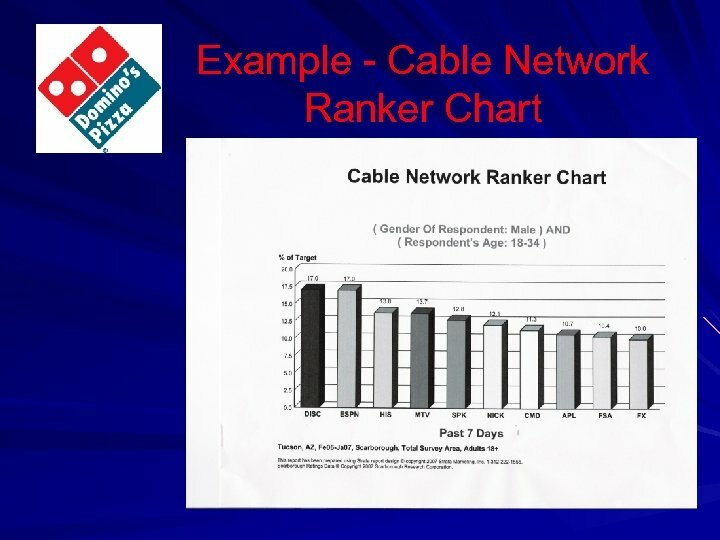 Be willing to commit a percentage of your budget to cable for the lower rates. 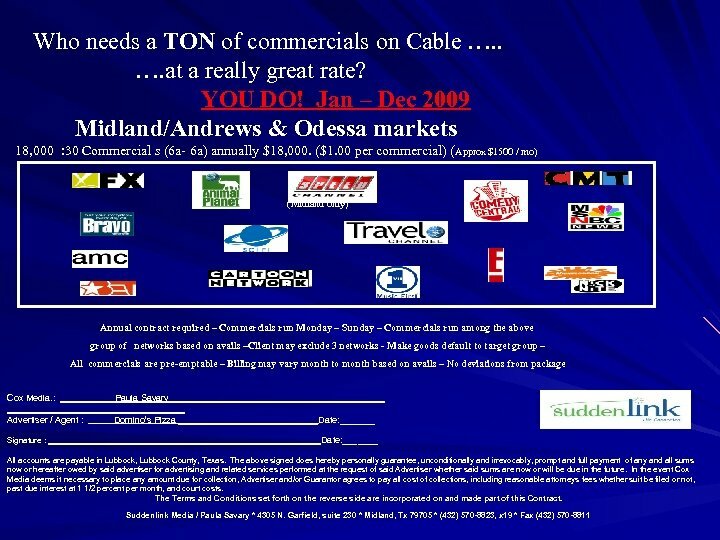 If you own stores in multiple markets with the same cable company (Cox, Sudden. 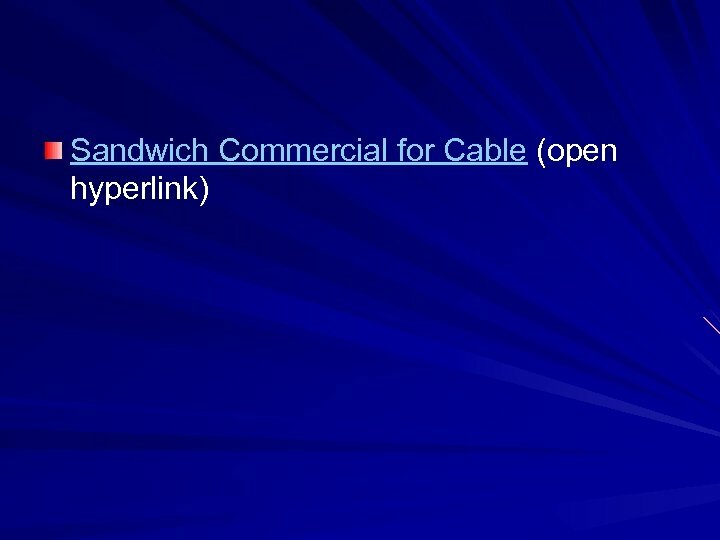 Link, Time Warner), leverage your media buys. – Use only one Account Executive – let them do the leg work and bring you the information on the other markets. Your time is too precious to deal with multiple AE’s. 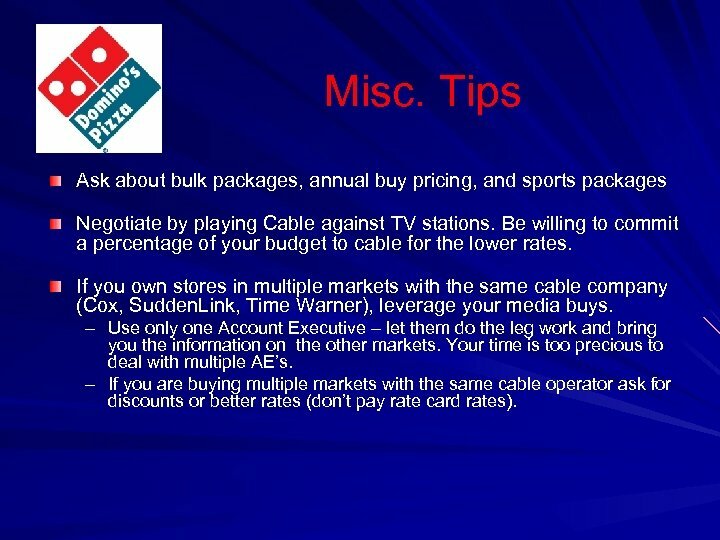 – If you are buying multiple markets with the same cable operator ask for discounts or better rates (don’t pay rate card rates).